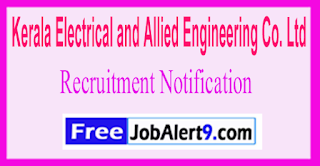 KEL (Kerala Electrical and Allied Engineering Co. Ltd) Has Released Recruitment Notification For 09 Site Engineer, Supervisor Posts. All Eligible & Interested Candidates Can Apply Offline.Further Detailed Information Regarding Educational Qualifications, Age Limit, Selection Procedure, Exam Pattern, Syllabus for KEL (Kerala Electrical & Allied Engineering Co. Ltd) Recruitment 2017 - 09 Site Engineer, Supervisor Post is mentioned below. Candidates upper age limit should not Exceed 25 Years As on 01-04-2017. Candidates should have done ITI (Mechanical or Civil or Electrical / Welder / Fitter) / Diploma / Engineering Degree (Mechanical / Civil / Electrical) or its equivalent qualification from A recognized university. Rs. 15,000/- (Post 1,4), Rs. 18,000/- (Post 2), Rs. 20,000/- (Post 3) . All Eligible & Interested candidates must send hard copy of application along with relevant testimonials (Mentioned In Detailed Advertisement) to the following Address before / (10th June 2017). Kerala Electrical & Allied Engineering Co. Ltd, 7th Floor, KSHB Office Complex, Panampilly Nagar, Cochin-682 036 . Closing Date to Submit Hard Copy of Application Form Is - 10-06-2017. Click Here For KEL Recruitment 2017, Advertisement.